Unfortunately for me, I wasn't blessed with amazing hair. In fact, I wasn't even blessed with great hair. My hair is fine, thin and pretty weak actually. Up until fairly recently I couldn't even get it to hold a curl! I've tried everything to improve my hair, get it's shine back and strengthen it and nothing has really given me great results and most of the products I've tried haven't had the best smell making me not want to continue to use it. And I'm going to be completely honest, if it's complicated I'm probably not going to stick with it. I've heard a lot of great things about organic hair products but up until recently I was hesitant about whether or not they were really that much better for you. 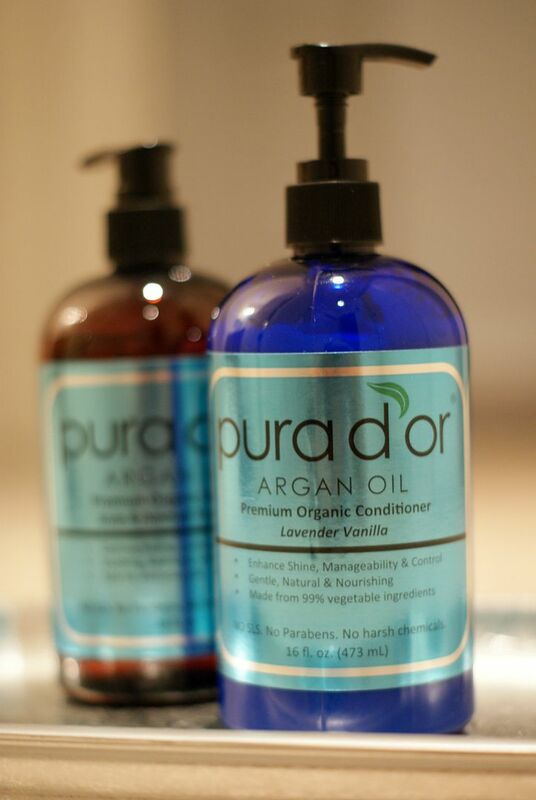 Enter Pura d'or organic products. After doing some research on Pura d'or and reading some reviews I knew I had to at least give it a try. Pura d'or products claim to be 99% vegetable based with no sodium lauryl sulfate (SLS), DEA, parabens, gluten, artificial colors, artificial fragrances and harsh preservatives. They are also infused with organic argan oil to add shine, body and moisturizers to all types of hair. I chose the Premium Organic Argan Oil Based Conditioner, Lavender Vanilla and the Premium Organic Argan Oil Based Scalp & Dandruff Shampoo to test out. Immediately I was impressed with the light fragrance associated with the products. It almost reminded me of baby powder, very light but pleasant and not overwhelming. Immediately I noticed my hair was easier to brush through and felt smoother. After a few days of use I did notice my hair breaking less and it definitely looked healthier. I can't really say for sure whether or not it's actually thickening or re-growing my hair since I haven't been using it long enough yet but I am impressed with the way it makes my hair look and feel and I love that I'm not putting a bunch of harsh chemicals in my hair potentially damaging it further. 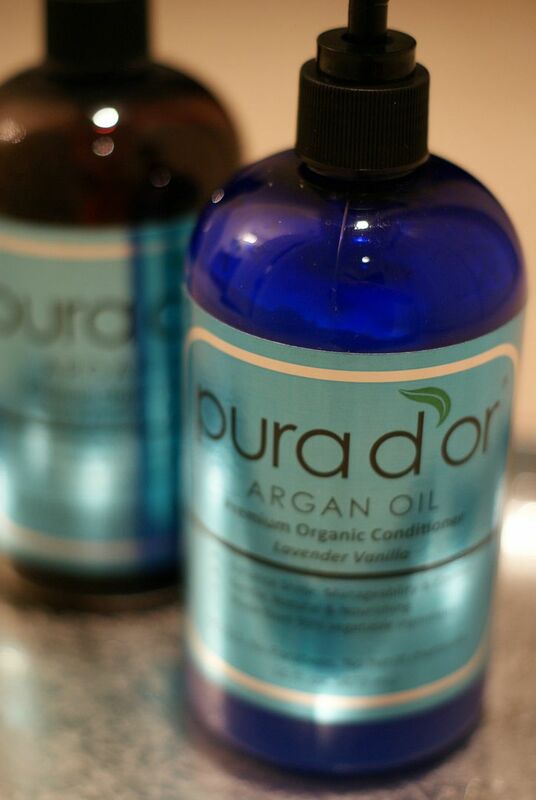 Have you tried Pura d'or before? If so, what are your thoughts? *This is a sponsored post written on behalf of Pura d'or for Brandbacker. All opinions are 100% mine. First, you have awesome hair! It's always styled soooo well, in my opinion. I am part of the fine haired club and it's tough isn't it? I started using organic hair stuff a few years ago [pureology] and can totally tell a difference. Howver, it doesn't smell as good as this stuff so I might have to give yours a try! I have a lot of very fine hair, so it can be unruly a lot of the time. Your hair looks great, so something is working in your favor!! Your hair always looks on point, friend! I've never given organic shampoos a try, but would love to know how you like it after some more time. I'm always on the hunt for that perfect shampoo! Your hair always looks soooooo good! I have just changed shampoos and I am not sold so I am going to check this out. I love any hair products with a pump....let's start with that! I can't tell you how many times I've injured toes in the shower by flipping over products.....anyways...I love products that you can actually read the back of the bottle! Thanks for the review! Perfect timing ;-) pinned! your hair always looks amazing, so there's that ;) my hair is super thin and fine and boring so i would definitely be interested in trying this - keep us updated if you continue to use it and like it! Argan oil is the best!!! I use it not only for hair, but my skin too. Your hair is amazing so you are doing something right pretty lady!!! I am a firm believer in natural products and the amazing benefits they give. Argan oil is amazing! I haven't heard of this brand before, but I would definitely try them!! This sounds awesome! I've been trying to use more shampoos with less chemicals too! I think it really helps with breakage! Great review girl! I always think your hair looks fabulous! These seem like some great products ! i have tried this but i've always heard argan oil is good for your hair! good review! Yay, I hope you really do love this product! It usually takes a few months to really be able to tell if more hair is growing in, but if it's helping with breakage?! Score! Although I have a lot of it, my hair is super fine. I need to use really good products to prevent breakage, I want to check this out! I think your hair looks beautiful! I've never heard of this brand before but definitely going to look into it more - I'd love to switch over to more natural/organic products! So for thinking you don't have nice hair you do an amazing job making it look so beautiful! Finding a hair product or regime that really helps your hair is one of the best discoveries! I would love to hear an update on this product. My hair is super thin/fine as well and always has lots of breakage. I started using Nioxin a few months ago to see if that helps and while it is better than other stuff I have used, it isn't amazing. I am looking for the holy grail product but I may try this! Cant hurt, right? I was wondering how this worked! I will have to try it out, I'm right there with you with the fine hair. I envy everyone with some luxurious curls! I basically could have written your first couple sentences because I suffer from the same hair genes! And on top of that I've suffered from a lot of breakage after giving birth (18 months later and it's still pretty dreadful!). Thanks for giving such a detailed review and I'm definitely going to check out this line - especially with Summer coming up! I'm so glad you posted this! The shampoo I've been using isn't working as well as it use to and I need something new! I might have to try this! I use Argon oil as well but a different brand!